This spacious home is ideal for a holiday getaway catering for couples, families or just you and your friends. Santorini has 4 bedrooms, 2 with ensuites, all very large rooms, 3 bathrooms (2 bedrooms are ensuited) and an open plan living/dining/kitchen on the upper level. A games room, office and external undercover area on the ground floor mean that you and your extended family can come on holiday and together and not be tripping over each other. There is a stunning feature glass window running along the stairway. A huge verandah with timber louvers on all sides to create cross flow breezes to keep you cool all year round. The pool has a surrounding timber deck perfect for sunbathing and reading, and the upstairs verandah has an under roof sitting area for supervising the bigger kids in the pool. Santorini offers the perfect tropical getaway to relax while still being able to enjoy all the restaurants and facilities of the local area. Palm Cove Village is a fun and relaxing beach front filled with cafâ life, alfresco dining, boutiques and galleries, all just a 5 minute walk away. If you are looking for a holiday to relax and unwind with your family and friends then Santorini is the perfect choice. 3 night minimum stay in low season. Minimum 4 nights in high season. Port-a-cot (no linen provided) & High Chair - Guest to clean after each use. Pet Friendly on approval with a $500 pet bond payable. Palm Cove approximately a 25 minute drive north of Cairns. Palm Cove is an intimate coastal village with internationally renowned restaurants and many gift and boutique shops. 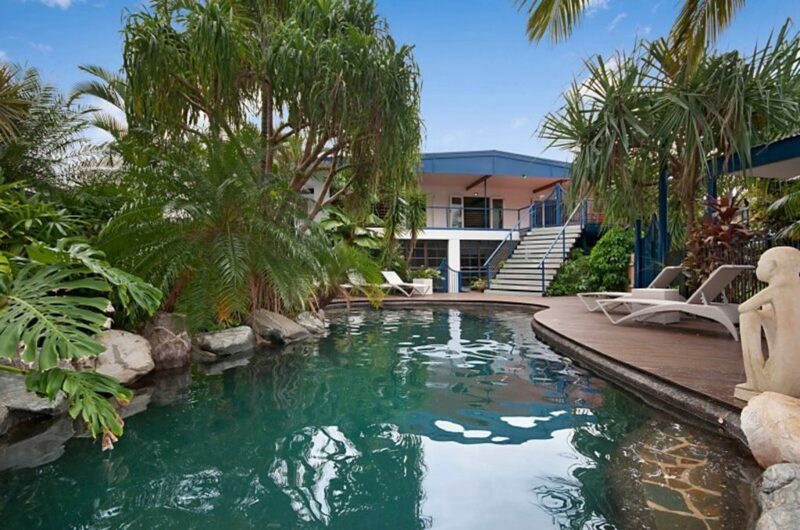 Enjoy the laid back lifestyle of the beachside and easy access to the Great Barrier Reef. Palm Cove is spectacular, no matter what direction you look, nestled between two World Heritage sites - The Great Barrier Reef and The Daintree Rainforest. Palm Cove has a variety of spas offering Indigenous inspired treatments and natural, tropical products in treatment rooms overlooking the Coral Sea. One treatment is never enough! From small beachfront cafes to 5-star a la carte restaurants or private on-beach dining, including three of Australia's top 200 restaurants, the only hard part about eating in Palm Cove is choosing where to go. Hire a bicycle and explore Palm Cove and surrounds using the network of smooth bike paths connecting the Cairns northern beaches. Australian Surf Live Savers are on duty daily and safe swimming nets make Palm Cove Beach an ideal location for year round fun in the sun. The Great Barrier Reef and the Daintree Rainforest are all within easy reach. Enjoy swimming or sun bathing at a local beach or try jet skiing, sailing, kayaking and stand up paddle boarding to nearby islands or fishing. Stroll along The Esplanade or take a swim in the man made lagoon. Cairns is also the home of SCUBA Diving in Australia and there are a number of companies offering dive trips and dive courses. Other local attractions include the Botanical Gardens, Skyrail Rainforest Cableway and Scenic Rail to Kuranda, Tjapukai Aboriginal Cultural Park, Cairns Kart Hire and Laser Tag or try cable skiing at Cairns Wake Park or if you dare AJ Hackett's Bungee Jump. Visit and feed the crocodiles at Hartley's Crocodile Farm. If you want to explore further afield you could visit Paronella Park, go wild water rafting at Tully, Sky Dive, tour the Tablelands or simply take the beautiful scenic drive to Port Douglas. Please contact us if you are interested in this property or others like it.